Home / ANIMATED FILMS / Be Part of a Heartfelt Journey in "The Good Dinosaur"
Be Part of a Heartfelt Journey in "The Good Dinosaur"
Disney•Pixar’s "The Good Dinosaur" asks the question: What if the asteroid that forever changed life on Earth missed the planet completely and giant dinosaurs never became extinct? Pixar Animation Studios takes you on an epic journey into the world of dinosaurs where an Apatosaurus named Arlo makes an unlikely human friend. “From the moment Arlo is born, he’s afraid of the world,” says director Peter Sohn. “He’s fun-loving and determined; he’s got a lot of fire when it comes to his desire to help his family. But he’s scared. His fear holds him back. The voice cast includes Jeffrey Wright ("The Hunger Games: Mockingjay" - parts I & II) as Arlo’s wise Poppa, Frances McDormand (HBO's "Olive Kitteridge") as Arlo’s strong Momma, Marcus Scribner (ABC’s “black•ish”) as Arlo’s brother Buck, Raymond Ochoa (“Disney’s A Christmas Carol”) as Arlo, Jack Bright (“Monsters University”) as Spot, Steve Zahn (“Diary of a Wimpy Kid”) as a fearless pterodactyl named Thunderclap, AJ Buckley (FX’s “Justified”) as teen T-Rex Nash, Anna Paquin (HBO’s “True Blood”) as Nash’s tenacious sister Ramsey, and Sam Elliott (“Ghost Rider”) as T-Rex patriarch Butch. 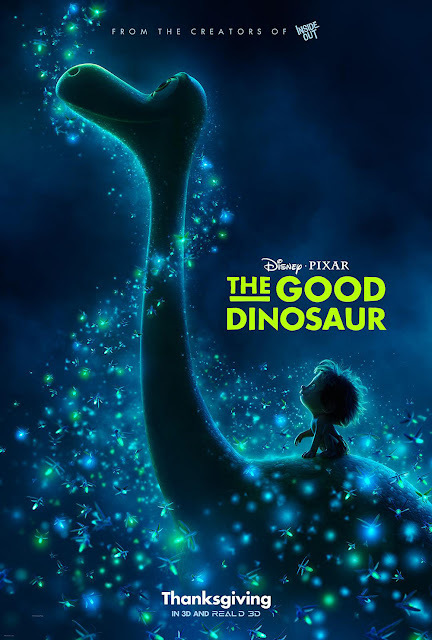 Disney•Pixar’s “The Good Dinosaur” is executive produced by John Lasseter, Lee Unkrich an Andrew Stanton. The film features music by Academy Award®-winning film composer Mychael Danna (“Life of Pi”) and Emmy®-nominated composer Jeff Danna (“Tyrant”). Opening across the Philippines on November 25, “The Good Dinosaur” is distributed by Walt Disney Studios Motion Pictures International through Columbia Pictures. Follow the official social media accounts of Disney in the Philippines, namely, (FB) WaltDisneyStudiosPH, (Twitter) @disneystudiosph and (Instagram) @waltdisneystudiosph and use the hashtag #GoodDinoPH.